Engraving on paper with wide margins. Measurements at the printed edge: 46.5 x 57 cm (18.3 by 22.4 in). With the designation on the lower edge: Desine par Charles de Grainberg, 1815. Grave par Ch..es Haldenwang 1817. With French and German text of the presentation below: ... " Zweyte allgemeine Ansicht des Schlosses der Stadt und des Thales von Heidelberg“... „Vom fuse des alten Schloßes auf dem kleinen Geilsberge." In the center with the crest. Large print with a view over the rooftops of Heidelberg to the castle. ...„Haldenwang was one of the finest German landscape engravers of the incipient 19th Century"... (see exhibition-catalog at the residence Staatliche Kunsthalle Karlsruhe, 1990, p.125). 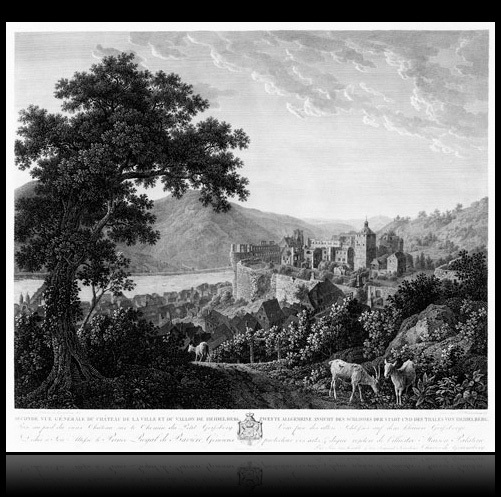 This view from Heidelberg is also mentioned in the artists biographical notes at Thieme-Becker, vol XV, pp. 498-499.